– Where should the NNI research be distributed on Pasteur’s Quadrant? (i.e., what is the appropriate mix of basic and applied research)? – Are there new forms of public/private partnerships that you could recommend to improve commercialization? – How should the NNI infrastructure be adapted to respond to future needs? – How do we develop appropriate risk analysis to ensure maximum benefit for society? – How do we engage stakeholders in both anticipatory and participatory governance (in the context of the NNI) regarding the future of nanotechnology? – With respect to this goal, what has the NNI done right and what should it continue doing? – With respect to this goal, where has the NNI headed down the wrong path? – What can the NNI do in the future to address this goal? After an hour of public comment, we had a networking reception with over 100 leaders of the Nanotechnology Community. – Congressman, Daniel Lipinski http://www.lipinski.house.gov/. Congressman Lipinski earned a Bachelor’s Degree in Mechanical Engineering from Northwestern University, a Master’s Degree in Engineering-Economic Systems from Stanford University, and a PhD in Political Science from Duke University. The Congressman is a big supporter of nanotechnology. Then, we went back to our groups to reprise discussion of goals from day 1 breakout groups as well as discussions on implementation of goals and objectives. Additional news announced from the NNI Event was the launch of the National Nanotechnology Initiative Strategy Portal. I enjoyed my discussions in Washington reviewing the last 10 years of the NNI and US strategic planning for the next 10 years. Last month on June 14-17th, the NanoBusiness Talent Program www.nanobusinesstalent.org kicked off its third year in Argonne, IL. The event, which was led by NanoBusiness Talent Program Director, Lesley Hamming, PhD, was a nanotechnology boot camp in conjunction with several of the nation’s top scientists at the Center for Nanoscale Materials (CNM) at Argonne National Laboratory in Argonne, IL. Twenty-five students from Illinois, North Carolina and Colorado participated in hands-on laboratory experiments, demonstrations and lectures by CNM scientists. Nathan P. Guisinger, PhD, taught students about the fundamental instruments of nanotechnology, including scanning tunneling microscopy and atomic force microscopy. Elena Shevchenko, PhD, demonstrated self assembly, and Elena Rozhkova, PhD, lectured on protein synthesis. Students conducted experiments such as synthesizing gold nanoparticles with Galyna Krylova, PhD. Gold nanoparticles could ultimately be used in novel cancer therapies and diagnostics. Daniel Lopez, PhD, discussed MEMS/NEMS while Dave Czaplewski, PhD, gave the students a tour of the clean room. The NanoBusiness Talent Program is a nonprofit dedicated to connecting high school students with leading nanotechnology innovators by arranging educational opportunities and internships. Funded through a grant by the Department of Energy, the NanoBusiness Talent Program’s mission supports President Obama’s push to make U.S. students more competitive globally in science, technology, engineering and math. I would like to commend Lesley Hamming, PhD for her enthusiasm and passion in leading the NanoBusiness Talent Program for the past three years. We look forward to Lesley’s vision for further growth in 2011. On Thursday, July 1st, the NanoBusiness Alliance issued a Position Statement on Nanomaterials Product Sustainability, which reflects NanoBusiness Alliance members’ enduring commitment to managing effectively the environmental, health, and safety (EHS) implications of nanotechnology. The NanoBusiness Alliance is committed to being the leader in the sustainable development of nanomaterials around the world. We are committed to working with governments and nanomaterials stakeholders to manage the sustainable development and use of nanomaterials in a responsible way. The NanoBusiness Alliance has long advocated on a wide variety of business issues pertinent to the development and commercialization of nanomaterials and nano-enabled products, including securing funding for nano enterprises, the elimination of trade barriers, and encouraging and supporting nano innovations and their successful transition from research into sustainable commercial enterprises that create jobs and revitalize the U.S. economy. Recognizing that successfully managing EHS issues is an essential component of the commercialization of nano innovations, the NanoBusiness Alliance has redoubled its commitment to and its focus on these EHS issues. The NanoBusiness Alliance has consistently supported its members’ commitment to EHS excellence and our Position Statement embodies this long-standing commitment. The NanoBusiness Alliance will continue its leadership in this essential area. As an enabling technology applicable to diverse fields, including alternative energy, medicine, and electronics, among many others, nanotechnology offers tremendous value to society. As with any emerging technology, nanotechnology and nanoscale materials must be managed in a responsible way to identify and minimize any potential adverse effect on human health or the environment. The Alliance is committed to fostering the responsible and sustainable development of nanotechnology, to working with governmental and related nanotechnology stakeholders to develop appropriate scientific testing tools, methodologies, and data to characterize nanoscale materials, and to developing informed, science-based governance policies, laws, standards, practices, and regulations pertinent to nanoscale materials. I www.vincentcaprio.org would like to invite you to our upcoming Webinar to be presented by Dr. Mostafa Analoui, Head of Healthcare and Life Sciences for The Livingston Group www.livingstonsecurities.com. This Webinar is titled “NanoMedicine: Current State of Global R&D, Investment, and Future Outlook” and will be presented via a unique interactive online platform. This event will be held online on Thursday July 22, 2010 from 1-2PM EDT. Co-presented by the NanoBusiness Alliance, the webinar is a unique and by-invitation only event designed around important critical issues for innovators and investors. Dr. Analoui’s presentation covers key R&D and product developments around use of nanotechnology in drug discovery, diagnostics and medical devices. He will also offer a snapshot of historical trends in investment, M&A and exits in this area, as well as what is shaping capital markets, especially in light of recent turmoil in the financial markets. Dr. Analoui will also offer an outlook of regulatory environment, role of major pharmaceutical, diagnostic and medical device players in future R&D, venture investments and M&A deals. Please confirm your participation with Zach Schultz zachary@livingstonsecurities.com. Additional information for Virtual Reality platform and instructions for webinar will be sent to confirmed participants. I have known Dr. Analoui for over 9 years and I find his insights and observations in regard to nano medicine to be valuable. I would like to share with you his bio. Mostafa Analoui, Ph.D., is Head of Healthcare and Life Sciences at The Livingston Group (New York, NY) and Chairman and CEO of Cense Biosciences, Inc. Previously he was the Senior Director at Pfizer Global Research and Development. He is also adjunct Professor of Oral Pathology, Medicine and Radiology at Indiana University. Dr. Analoui is actively involved in investment, management and scientific/business development of nanotechnology, drug discovery/development, diagnostic imaging, and global strategies. While at Pfizer, he was the Site Head for Global Clinical Technology in Groton and New London, a division focusing on emerging technologies for development and validation of biomarkers and diagnostics for drug development. Prior to joining Pfizer, Dr. Analoui was the Director of Oral and Maxillofacial Imaging Research, Associate Professor of Radiology at Indiana University, and Associate Professor of Biomedical Engineering and Electrical & Comp Engineering at Purdue University. He was also President and CEO of Therametric Technology Inc. He has received his Ph.D. from Purdue University, followed by Post-Doctoral Fellowship at IBM TJ Watson Research Center in NY. In addition to industry leadership in biomedical and technology fields, he consults and lectures in US, Europe and Asia. He has also served on various scientific, regulatory, and business advisory committees and boards, including NIH, NSF, PhRMA, NASA, and OECD. Dr. Analoui has authored over 130 publications, including journal articles, book chapters and technical reports. He is senior member of IEEE, SPIE, and RSNA. He currently serves as board member of VirtualScopics (Nasdaq: VSCP), Calando Pharmaceutical (Nasdaq: ARWR), BEACON (Biomedical Engineering Alliance and Consortium) and Advisory Board for the NanoBusiness Alliance. We look forward to having you participate in this exciting event. I would like to share with you a letter in regard to a fabulous program taking place this fall in Washington, DC. Our good friend Larry Bock is one of the organizers of this event. Larry would like to share some of the details with you. I hope you have the time to participate in this fantastic event. Here are some of the details to date. 50 Government Agencies and Federal Laboratories including NIH, NSF, EPA, USDA, FDA, NASA, NDEP, Office of Naval Research, Department of Energy, Air Force Office of Scientific Research, Lawrence Berkeley Laboratory, Fermi Accelerator Facility, …. 25 High Technology and Life Science Companies including Lockheed Martin, Life Technologies, Northrop Grumman, Intel, CISCO, Scientific American, Research in Motion, SpaceX, Hitachi, …. 75 Informal Science Outreach Organization including the Smithsonian, American Museum of Natural History, US Botanic Gardens, Koshland Museum …. We have raised approximately $1.75M from about 40 corporate, government and individual sponsors in just 8 months. This is still short of our goal of $2M, but we are on our way. If there is any way you can help, we appreciate introductions! The USASEF is hosted by Lockheed Martin and sponsors include Life Technologies Foundation, K&L Gates, Clean Technology and Sustainability Industries Organization (CTSI), Larry and Diane Bock, ResMed Foundation, Farrell Family Foundation, Alexandria Real Estate Equities, Northrop Grumman Corporation, Agilent Technologies, Amgen, Celgene Corporation, Cisco, The Dow Chemical Company, National Institutes of Health, Illumina, The Kavli Foundation, Intel Corporation, You Can Do the Rubik’s Cube, Vertex Pharmaceuticals Inc., Genentech Inc., MedImmune, Sandia National Laboratories, Project Lead The Way (PLTW), Baxter International, Celestron, University of Maryland, NuVasive Inc., FEI Company, Case Western Reserve University, Biogen Idec Foundation, LifeStraw®, Microsoft Corporation, Draper Laboratory, Silicon Valley Bank, Bechtel Corporation, SpaceX, the National Radio Astronomy Observatory, Research in Motion, Thirty Meter Telescope Project, Virginia Commonwealth University and the Astronomy Outreach Foundation. We have secured over $2M in Media Sponsors which means free advertising on TV, radio, web, print and social media marketing of the Festival. If you have any media contacts, and can make an introduction, that would be great. Current media partners include Discovery Communications, Popular Science and Science Illustrated, New Scientist, EE Times Group, SCIENTIFIC AMERICAN, POPULAR MECHANICS, ScienceBlogs, Technology Review published by the Massachusetts Institute of Technology, The Epoch Times, “WAMU 88.5 – American University Radio,” C&EN, the newsmagazine of the chemical & related sciences, Forbes Wolfe Emerging Tech Report, PBS, Career Communications Group, Engineering.com, the Northern Virginia Technology Council, CrazyEngineers.com, FAMILY Magazine, American Scientist, SciVee, Inc. and SchoolTube, LLC. In addition we have Media Deals with WJLA (Washington, D.C. affiliate), WTOP, EL SOL (CBS Radio Spanish station) and the Washington Post. Our finale event has grown so much that we will currently occupy the following major venues: the National Mall from 1st-7th Street, Mellon Auditorium, Wilson Plaza, Freedom Plaza, Pennsylvania Avenue (from 12th-14th Streets) and 4th Street (between Jefferson and Madison). In addition, our three weeks of Festival Programs will take place in over 100 separate venues throughout the Greater Washington, D.C. area. We received a lot of help from the Washington Board of Trade, K&L Gates, OSTP and the D.C. Office of Technology and African American Relations in securing the amazing street closures above. 50 leading scientists and 20 Nobel Laureates will do programs in schools throughout the Greater D.C. Area in the month leading up to the Expo. Anthony Fauci, Astronaut Donald Thomas, Physics of Super Heroes expert James Kakalios, Science of NASCAR Expert Diandra Leslie-Pelecky, and many many more. We have catalyzed the growth over over 30 Satellite Events that will occur throughout the United States on the same dates as our finale Expo including major events in Austin, TX, Raleigh/Durham, NC, Berkeley, CA, Clinton, NJ, Tucson, AZ and many more. Some of these will be huge events as well. Tell your kids, friends’ kids and kids’ teachers to enroll in some of these competitions! Thank you Larry for all your hard work on this event. It is an honor to be involved. We look forward to seeing you this fall in Washington, DC. I wanted to thank so many of you who came out for our first regional WIA event in Dayton Ohio. The Dayton Water Conference http://www.daytonwaterconference.org/ saw 300 industry leaders come together to talk, debate and network around water innovation and technology, and also put a special emphasis on the Dayton Ohio region and its many assets and efforts in the water sector. We really couldn’t have asked for better hosts than the great people of Dayton, from the Dayton Development Coalition, Jim Leftwich, CEO and Maureen Patterson, Vice President. Right before going to Ohio for the event, I had the chance to speak for an hour with Michael Shapiro the Deputy Administrator at EPA for water at his office in DC. We have had a fantastic working relationship with EPA since our launch a year and a half ago, particularly with Sally Gutierrez who runs their risk center in Cincinnati and Nora Savage from their DC office who has long been a friend on all things tech. Mike was great to talk to and provided a lot of insight into EPA’s more intense focus on entrepreneurial solutions to assist EPA in its mission. I can’t go into much that is in development at this time, but I can say that we are working with Sally right now on a CREDA between the WIA and EPA. There are discussions on how our members and the WIA team can better help the EPA on a number of fronts, particularly around new technologies and start-ups. To note topics that are in this new issue to make you keep reading, we have a fantastic interview with Dr. Mark Shannon, additional information on our Chicago Water Innovations Summit, a tribute to Jacques Cousteau and the latest news for the water technology world. Speaking of events, our Second Annual Water Innovations Summit will take place in Chicago on September 28-29, 2010 at McCormick Place. Our 2009 show was an incredible success and with the feedback we are getting, the 2010 event is going to be even better with the key stakeholders in water technology and water innovation in attendance. – Will America Accept Water Reuse? – Where is the US Government Going on Water – Priorities, Funding & New Regulations? The site for the Chicago event will be up next week, but if you are interested in speaking, exhibiting or sponsoring, please contact Vincent Caprio vince@waterinnovations.org immediately as we only have a few spots left. As to WIA membership, I want to note that to date we have had 100% renewal of our membership (thanks folks!) so we must be doing something right. We also have several new members that have come online that we will highlight in the next issue. On another functional point, the Water Innovations Alliance and Water Innovations Foundation are no longer joined at the hip. More on that in the next issue, but be sure to check out the new Water Innovations Foundation website and workplace platform www.waterinnovationsfoundation.org that we recently launched with the incredible efforts of Tally Fox: www.tallyfox.com/. A special thanks to Trudi Schifter, TallyFox’s tireless CEO. A little inside shop talk here at the Water Innovations Alliance. I have been dealing with a serious medical issue the past few months including a stint in the hospital a week ago. I appreciate all the well wishes and want to say thank you, and let you know I am back at the helm. I wanted to take a second to thank my partner and friend in all of this, Vincent Caprio www.vincentcaprio.org for his incredible efforts and exhaustive diligence handling things in my absence. He is truly a force of nature as any of you who have met him well know. I should note that Vincent recently attended Corporate WaterVision 2010 http://www.infocastinc.com/downloads_pdf/corporatewater_agenda.pdf, a very informative water conference in DC. 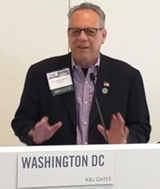 He enjoyed the Luncheon Keynote Address: Obama Administration Initiatives, presented by Peter S. Silva, Assistant Administrator for Water, US Environmental Protection Agency. Vincent also filled in for numerous speaking engagements the past few weeks in DC, Denver, New York and Massachusetts. What would the WIA be without him? We are going to try and move the newsletter to twice a month and look for more efforts on the communication front flowing from Twitter and Facebook. The newsletter this month is blessed to have received some time on the schedule of the busiest man in water, Dr. Mark A. Shannon. Dr. Shannon has unmatched insight into the water sector as a whole. He is the Director of the NSF STC WaterCAMPWS, which is a multiple university and government laboratory center for advancing the science and engineering of materials and systems for revolutionary improvements in water purification for human use. He is also the Director of the Micro-Nano-Mechanical Systems (MNMS) Laboratory at the University of Illinois at Urbana-Champaign, and is the James W. Bayne Professor of Mechanical Engineering. Dr. Shannon received his B.S. (1989) M.S. (1991) and Ph.D. (1993) degrees in Mechanical Engineering from the University of California at Berkeley and numerous awards including the NSF Career Award, Xerox Award for Excellence in Research, an the BP Innovation in Education Award. He recently served as a keynote at the Water Innovation’s Alliance Dayton Water Conference. WIA: Mark, thanks again for taking the time to give us some of your insights. 1. Lets start topical, without going into finger pointing or analysis of the “who” “what” “why” – how bad is this Gulf oil spill for our nations waterways? MS: Probably the most significant damage is that which is unseen. The main publicity is about the oil reaching the beaches, and the oil and tar on the beaches and birds. But perhaps the most significant is the solubilization of the hydrocarbons being emitted into the water itself. Long chain hydrocarbons are difficult for sea life to digest, even at the bacterial level, and will alter the types of sea life from those that are not able to adapt to those that are, giving a significantly different ecology that is mostly foreign to what is healthy for our waterways, and for the seafood on which we rely. The use of dispersants to break up the oil, accelerate the process, creating large, almost untraceable plumes of hydrocarbons moving through the seas. But dispersants by their nature, with having both hydrophilic and hydrophobic groups, create huge numbers of small droplets of oil that wildlife consume, poisoning them. It will take a very long time for the ecology to recover from this problem. But perhaps the most potentially damaging to waterways and their outfalls in both the Gulf and potentially Atlantic regions is the result of injecting dispersants at the well head. The very high pressures of water and oil combined with the dispersants to create a new form of hydrated hydrocarbon plume that is unknown in nature, which is heavy and presumably toxic. Where this plume will move, and what damage it will do to life on and near the seafloor is something that needs to be better understood to know what potential harm it can have to the Gulf, Atlantic, and our waterways. WIA: There was a lot of interest generated by Kevin Costner’s celebrity and the fact that new technologies are being explored for handling this epic disaster. What ones have you heard about being used, bought, etc? Any that you can think of that might be helpful? MS: There are a lot of technologies that can separate oil from water, including those like Costner’s using membrane separation to ones using centripedal forces – presumably one could combine these to get even higher performance. Oil-water separators are used in almost all old oil wells to separate the water coming up from the oil. They work, and are efficient. Are they enough to deal with the huge amounts of oil and water from this spill? From the report on ABC News, BP is now trying 32 of Costner’s machines to clean 6 million gallons of water per day. A large number, but a drop in the ocean. We need far more machines, and perhaps one that can separate it at the well head as fast as it is coming out. That is a tall order. Even at the far too low initial value of 5,000 barrels of oil a day (210,000 gallons), once mixed with water at the surface you are talking about some 1,000 times that mixed with water (200 million gallons a day, needing 1,120 machines). At the more realistic 2 million gallons of oil coming out, we’d need 10,700 machines to make a dent. Clearly, more efficient separators are needed, and ones that can separate near the source and pull the oil up to the surface. Is it possible? Yes. Are there any other than Costner’s that I know of? No. WIA: During your talk at the WIA water event in Dayton, you talked a bit about the water-energy nexus, from how much energy is used by our need to access water, as well as how much energy is inherently embedded in wastewater. Can you expand a bit on this and take us through this fascinating meeting of these vital sectors? MS: This requires a detailed answer that is perhaps not best done in a short response. But at the risk of over simplifying, the embedded energy contained in wastewater includes all the energy first needed to provide the freshwater used, which includes its supply, transport, treatment, and distribution. This energy averages about 1 kWhr per cubic meter of water (264 gallons) across the U.S. The figure may be much higher or lower depending on location. The next big contribution is the energy needed to collect, treat, and discharge the wastewater and to dispose of any sludge. The energy spent to do so can also average about 1 kWhr per cubic meter, particularly when one factors in the chemical energy used to convert the organics within the wastewater to CO2 and H20, and the energy needed to denitrify the reactive nitrogen (urea and nitrates primarily to N2). The largest gain in recovering both the energy within the wastewater and producing energy from it as well as producing clean water from the effluent for reuse for non-potable purposes is that the over 1 kWhr of electric power can be recovered from the wastewater, and nearly 2 kWhr avoided for supplying the fresh water that does not now have to be supplied and the energy needed to treat and dispose of the waste. So the total energy “gained” is nearly 3 kWhr per cubic meter (11 Wh/gal). Considering that we treat over 7 trillion gallons of wastewater per day in municipalities alone, there is an embedded energy of some 75 trillion Whr of energy there. WIA: Now you don’t come from the traditional industry background in the water field. Out of all you have been exposed to over the years, what has surprised you most – particularly in regards to technology and innovation? MS: I think the biggest surprise has been the creation of new technologies out of nanoscale constructs; constructs that were not even thought of 10 years ago, such as carbon nanotube membranes, ones based on aquaporins, others based on nanophase aggregated polymers, and sensors based on manufactured catalytic DNA. These ideas were not even in the labs 10 years ago, and now we have start up companies for all of these moving towards actual products. The pace of innovation at the nanoscale has been dizzying, and that they are in the process of adoption is truly mind-blowing, particularly when all the experts said that these technologies could never be scaled up. We still are waiting on actual large scale production, but hopefully one or more will prove the naysayers wrong, at the benefit of everyone. WIA: That leads us to reuse. What are you seeing develop in this field as far as new technologies and developments as well as adoption? Certainly, the U.S. is a laggard in this area, especially when compared to Switzerland, Singapore and others. What will change that? MS: Europe and Asia have products in the marketplace (as well as some U.S. companies) in aerobic microfiltration membrane systems, combined with RO filtration for reuse. The early adopters will use these systems first, primarily for their small footprint and relatively high throughput. If the U.S. can leapfrog these technologies with high efficiency anaerobic bioreactors that produce useable energy as well as clean water, without an additional RO stage, we can catch up and create new markets in reuse, particularly for industries, apartment/condominium complexes and small developments. Distributed systems with added value will likely be the first adopters, which will realize relatively short term payback from avoided sewer connection charges and reduced water demand, with reduced energy bills an added plus. WIA: What 3 or 4 technology developments in general are exciting you the most in the water field? Forward Osmosis? RNAi water treatment? What type of things should folks be looking out for? MS: Perhaps I am a bit biased, as the work going on in the WaterCAMPWS is very exciting to me. But there are others that I am excited about. FO is an exciting technology for a couple of key applications. FO should be immediately competitive for concentrating wastewaters to relatively high organic content, while extracting clean water that will need only polishing afterwards to obtain high quality water. It will also find good use in brackish waters. FO may be competitive for desalination if the cost of the membrane and balance of plant can beat RO, and the presumably lower operating costs of FO bear fruit by using low quality thermal heat as the main mechanism for extracting the clean water and the potential for lower fouling also bears fruit, even considering the lower expected fluxes. FO can make a major play out of the gate if targeted well. R&D to reduce the cost of the membranes while increasing performance, such as work to incorporate aquaporins into membranes with thin supports might tip the scales. While considering hybrid thermal processes, some new approaches to combined cycle energy generation and freshwater from the saltwater intake cooling of the thermal electric cycle might come on the scene that can produce both power and water at competitive rates. The real driver here will be that power plants that cannot be currently sited due to the lack of, or uncertain fresh water supply, can find a second lease on life. Solar thermal generators in desert areas can also be used. The production of fresh water in these areas should be highly valued as well. Some key materials and system R&D is still needed for these technologies to leave the lab. On the detection side of the equation, robust, real time sensors are being developed using catalytic DNA and aptomers to detect heavy metals in sub-ppb levels, and potentially in the future viral particles. There are also emerging rapid PCR techniques for identifying huge numbers of biological pathogens in water. These systems might permit continuous sensing and readouts throughout a water system to ensure protection throughout. Continued R&D will produce effective units in the future. If low cost, they might open new markets such as personal sensors for individuals. But lots has to be done before those new markets emerge. Several non-chemical disinfection techniques might gain traction. The RNAi therapeutic might find a lot of traction in the developing world, if it can be brought down in cost and has proven efficacy. Lots more research is needed here. While UV is gaining traction and low cost UV LEDs might accelerate the use of UV light for disinfection, work on high kinetic photocatalysts in water might allow the use of blue light (which is much cheaper to produce) and solar light. In addition to various types of TiO2 work, mixed oxide photocatalysts might emerge as a contender. Lots of exciting work going on in the lab, and some companies are forming to commercialize. A couple of key breakthroughs can open up the space of non-chemical disinfection and decontamination of toxic compounds, such as pharmaceuticals and their decomposition products, without producing toxic byproducts themselves. WIA: Tell us a bit about your research in water. What type of things are you working on these days? MS: My group’s research focuses on desalination and reuse. In desalination, we are trying to develop a small scale desalinator (for individual units) that has the lowest possible energy consumption. The main focus is to find new ways to pretreat the water at low energy and no chemical use with low rejection (<10%), at a quality that a super flux membrane (made from aligned CNT membranes) will not foul. To do so, we have to remove all organics, silt and colloids down to 1 nm in size. We are also working on a solar thermal power generator that uses seawater for cooling, to produce 5 MW of electrical power, and about 36,000 gpd. Combined with this effort, we are investigating high-TDS residual treatment, including mineral recovery, as a way to facilitate more inland desalination. The other main focus is on reuse, to produce both clean water and net energy generation from blackwater from anaerobic digestion that produces high-methane content bio-gas. The objective is to use one stage of high-flux, low-fouling NF membranes for the permeate, operated in suction at less than 10 psi (2/3 of an atmosphere) so that flat panels can be used (i.e. no pressure vessels are required to reduce capital costs). The permeate is further treated with advanced mixed oxide photocatalysts with blue light irradiation to completely minearlize any hydrocarbons that made it through the NF membranes. The overall goal is that pathogen free, non-potable water can be reused for a number of uses, and net energy is produced, considering all inputs (pumps, electrical power for blue light, gas separation, etc). WIA: The WaterCAMPWS at the University of Illinois that you run is literally the only government water research facility. First off, what type of work is done at the facility and also how is that possible that there is only one? There are like 36 nanotech centers and one for water that the federal government supports. MS: The WaterCAMPWS conducts research in all areas of water S&T under two main themes: Water and Energy, and Water and Health. The Water and Energy theme includes research on new desalination modalities and technologies, reuse technologies with energy and nutrient recovery, new membranes synthesis and characterization, residual minimization with mineral recovery. The Water and Health theme researches new ways to decontaminate water from toxic oxyanions, toxic compounds such as pharmaceuticals and their decomposition products, and new ways to disinfect waters without producing toxic disinfection byproducts. The lack of large scale funding by the federal government on water science and technology is somewhat baffling to me, considering its vital importance to everyone in the U.S. The WaterCAMPWS has only two more years of funding from the NSF, and then that stops due to “term limits” in funding of all STC’s at 10 years, regardless of success or importance. I think in part the reason water research is not funded is that water is not forefront in citizens minds, like energy and jobs are. People, including those in Congress, do not see the connection of water to the economic output as they do with energy and nanotechnology. Of course, water is intricately connected with energy and economic output (the availability of high quality water in large quantities is one of the reasons the United States was able to become an economic superpower). Interestingly, some of the most exciting new developments in water involve nanotechnology – indeed water technologies might be the “killer app” that people have been looking for in nanotechnology. But that might end if water S&T research ends soon in the U.S., because most of the nanotechnology focused funding is in the energy sector. WIA: You do a lot of work at WaterCAMPS examining the state of water infrastructure. How bad is our nation’s water infrastructure? Is it a money issue? Can it be fixed? After he incident in Boston there has been some interest but its already fading. MS: The U.S. has some of the oldest water infrastructure in the world, which is surprising to many, but we haven’t had any world wars on our shores, as have Europe and Japan. And due to the enormous cost to dig up and replace pipes, particularly within cities, we are not likely to see any change in the next 50 years. With some 250,000 water main breaks a year in the U.S., the cost of just maintenance is in the billions every year, so there is a huge monetary driver for solutions. Add to this the high leakage rate (which in some old systems can be as high as 50% in some areas), increasing water scarcity will also be a driver to find solutions. I am at the AWWA annual conference right now and there are a large number of companies offering leak finder and pipe repair solutions. So there is obviously interest in supplying better solutions to our crumbling distribution system. I think in the future that an alternative solution will be to leapfrog classic centralized distribution systems with decentralized systems that supply and treat both water and waste locally, reducing the need for water input from afar. However, these systems will only be a partial solution, as the need to supply water for fire suppression and irrigation will still require large water input, but the quality can be lower. WIA: Ok, say you become President for the day, tell me the first three things you would do from a government and policy standpoint to begin address our nation’s water problems? MS: I would declare that water is a priority for the U.S., on par with energy, and direct agencies to develop plans for spurring R&D and innovation in the water sector. 2. To help facilitate innovators across the U.S. who have to grapple with multiple (and often conflicting) codes and jurisdictions, I would ask Congress to strengthen the EPA’s ETV program so that if vendors receive certification, that should be considered a acceptable for code compliance (I’m not a lawyer, so I don’t know how this can be done – but hopefully someone would in order to reduce litigation risk for innovators). 3. I would also direct the EPA to create national centers of excellence for S&T research in water, including purification technologies, and would increase funding for water in the SBIR/STTR programs to help small innovators move some of the R&D into practice. WIA: As always Mark, thank you so much for your time and insights. The Water Innovations Alliance is the public policy voice of the world’s water researchers, technologists and innovators. The Alliance’s role is to advocate policies that promote the aggressive development of water technologies and innovations across all sectors and users of water by creating new market opportunities, increasing funding, strengthening research and development programs, removing regulatory and market barriers and improving education, communication and outreach efforts. Contact Vincent Caprio at: vince@waterinnovations.org for more information. Attached is a wia_10_membership_form Membership Form. Friday, June 11th was the 100th Anniversary of the birth of Jacques Cousteau http://www.notablebiographies.com/Co-Da/Cousteau-Jacques.html and we would like to highlight activities celebrating the life of this legend. Fabien Cousteau http://www.fabiencousteau.org/, third generation ocean explorer, documentary film maker, environmental ambassador, grandson of Jacques Cousteau and Water Innovations Foundation http://www.wif.tallyfox.com/fabien-cousteau-0 Advisory Board member, launched a nonprofit organization in June called PLANT A FISH. Its core mission focuses on engaging and educating local communities and children toward the restoration efforts of their local marine environments. The lessons that participants will learn about nature and sustainable living are relevant everywhere. Initial programs include the planting of 1 billion oysters in New York City’s Harbor, 1 billion sea turtles in El Salvador and 1 million mangroves in Florida. Fabien hosted a PLANT A FISH reception http://www.fabiencousteau.org/index.php?s=26 on Monday, June 7th in Washington, DC in celebration of his grandfather’s 100th birthday. Vincent Caprio was in attendance http://www.vincentcaprio.org/vincent-caprio-fabien-cousteau-at-plant-a-fish-fundraiser at this special event. Please consider donating to this worthy cause. Don’t miss out on the fastest growing, most innovative event in water. If you are a new start-up, water agency, investment firm of Fortune 500 company, the Water Innovations Summit is your chance to become part of the conversation on water technology and innovations. Attached is a Sponsorship Form. You are currently browsing the Evolving Innovations weblog archives for July, 2010.